The government is floundering around trying to help the 16-24 year-old generation, who seem to have got shafted by the recession. Job-wise anyway. For those still in college, here’s a chance from Microsoft to get a few web skillz that could come in useful. Microsoft along with 123Reg is offering discounted website hosting and access to top-notch site-making tools. It’s not exactly a job with a 3 year contract – hell it’s not even a job, but it is an opportunity to play around with websites, get a little experience and get familiar with some of those little terms like MySql so you can put them on your CV. 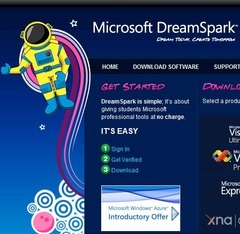 It’s part of Microsoft’s DreamSparks programme and is available to anyone with a ac.uk email address. If you’ve got time aside from the degree course and the night shifts at co-op, then you could spend it on making a professional grade website. The web-hosting side of the deal: 123Reg are offering web hosting for UK students at £1 a month – a saving of £1.49 a month on their cheapest deal – £2.49 p/m. Which is uh, a saving of £17.88 a year – not phenomenal but I suppose it’s worth exploring. If you want to keep your site with 123Reg after the £1 deal has elapsed, you’ll have to pay more: their cheaper packages are £2.49 a month or £5 a month. The Microsoft part of the deal is a bit more impressive, giving you access to some top level Microsoft tools like… Visual Studio, SQL Server and Expression Studio on your own PC. In fact this software is available to students whether or not they sign up to the 123Reg, just check the Dreamsparks site. Though of course, you don’t need to get so involved to make a simple blog. You can start up a blog or site very simply for free: through wordpress, blogger, tumblr or posterous to name but four. Though if you want to register a vanity url: yourname.com as opposed to yourname.wordpress.com, then you need to register the domain name somewhere like 123Reg or godaddy. To take up the deal, register on 123Reg here.